Whether it’s a family-sized summer road trip or the weekly routine of errands and after school activities, the Toyota Sienna does it all and makes it better – with big style and generous amenities, plus an easy-driving attitude and a new engine/transmission combination for 2017. New for 2017, all Toyota Sienna models are upgraded with a new, 3.5L V6 featuring D-4S Direct and Port Injection, plus a new Direct Shift 8-speed automatic transmission. This powertrain delivers 296 peak horsepower (up 30 hp from the previous configuration) and more torque – plus better fuel efficiency (10.9L/100km (FWD) city/highway combined) and smoother shifts. Bold exterior styling features plenty of windows to create a spacious, modern interior maximized by the available dual power moon roof. 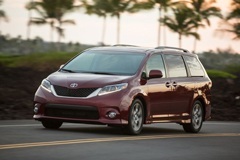 The Sienna is available in seven- or eight-passenger models that are easy to reconfigure for carrying people or an impressive amount of cargo. A choice of six models includes two with the extra all-weather confidence of all-wheel-drive, while several available upgrade packages and mobility configurations allow Canadians to choose the perfect Sienna for their lifestyle. Every Sienna is equipped with an extensive list of standard features, including touchscreen audio with Bluetooth capability, steering wheel mounted audio and voice recognition controls, SIRI Eyes Free mode, three-zone automatic climate control, cruise control, power windows and door locks, and more. In addition to the dual power moon roof, other available enhancements include navigation, an upgraded JBL audio system, integrated XM Satellite Radio, Dual-View Blu-ray entertainment system, the Driver Easy Speak system, and more. Safety is always standard on a Toyota, which is why every 2017 Toyota Sienna is equipped with active and passive safety features, including eight airbags, 4 ISOFIX child safety seat anchors, the Toyota Star Safety System, a back-up camera, and more. Available safety technologies include Rear Cross Traffic Alert, Blind Spot Monitor, and more.